Your day in pictures – share a stylish collage of the pictures which appeared in articles and media items you found interesting and chose to post that. 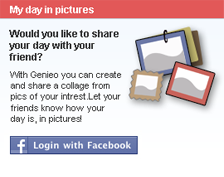 Easy to use – simply download and run Genieo, connect to Facebook, and you’re ready to go!. 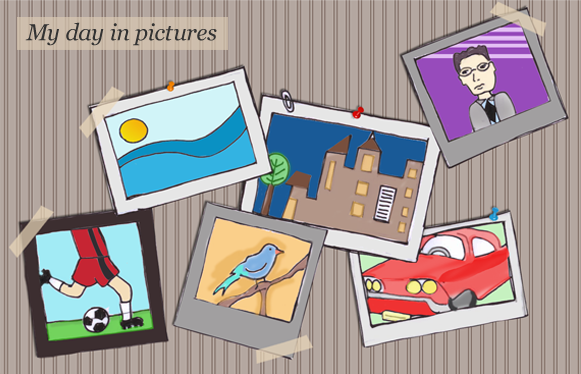 Preview and share – Genieo automatically selects and compiles the pictures for you. All you have to do is choose a template you like, add your comment, and you are done. What is Genieo? Genieo brings you the news you want, from your favorite sources, right to your own personal homepage, so that all you have to do is Be There Get Genieo Now! Genieo automatically connects to your favourite news portals and continuously updates your homepage with top news headlines. Genieo will filter by your preferred topics of interests, new posts and twits published by your favorite friends on Facebook and Twitter, and insert them right into your Homepage. Genieo will continuously follow your interests as you browse, learning and adapting to your topic preferences as they form, change and become more specific, and consequently will provide you with the most accurate results in terms of your interests. In addition, Genieo provides you with options to manage your preferences in order to further refine the accuracy of the results received. Genieo will automatically bookmark your favourite sites as you visit them, and manage these bookmarks in accordance with the level of interest you express in them, without interfering with your browser's bookmarking system. You will be able to access and manage your bookmarks directly on your home page. Genieo is always on the lookout across the web, for items you may find interesting. Based on the analysis of your choices and preferences, the Mini Topic Filtering System sifts through all the information at the highest resolution, and brings you only items which are relevant to you exclusively. Genieo streams real-time updates from ongoing events you follow, such as developing events on the news, Scores of sports matches, Stock Market information and more. Genieo will notify you as to special new updates to your home page, by sliding in a small message at the lower right corner of your screen, briefly informing you of the added item. Share items from your homepage with your favourite networking community, with a press of a button. Simply follow the installation wizard. Allow Genieo some 20 minutes to create your profile and generate your personal homepage. Open your browser on your newly created personal homepage, and explore your interests through the unique features offered by Genieo.